Tonights rematch against the NY Islanders will again showcase the grudge-holding talents of Ryan Hollweg, Chris Simon, Colton Orr, and perhaps a special goalie-to-goalie brawl between overpaid DiPietro and our very own Ranger Al Montoya. Hang on to your seats and leave the kids home for this one, because it will be a trip to the old days when Islander hatred at the Garden will be showcased. Some things will never change!This is the last pre-season opportunity for some of the new Rangers prospects to make a starting impression with Coach Renney. Should be a rodeo! Brendan Shanahan scored twice to lift the New York Rangers to a 5-2 victory over the New York Islanders in a preseason game Friday night that lacked the star power and brawling of their previous matchup. 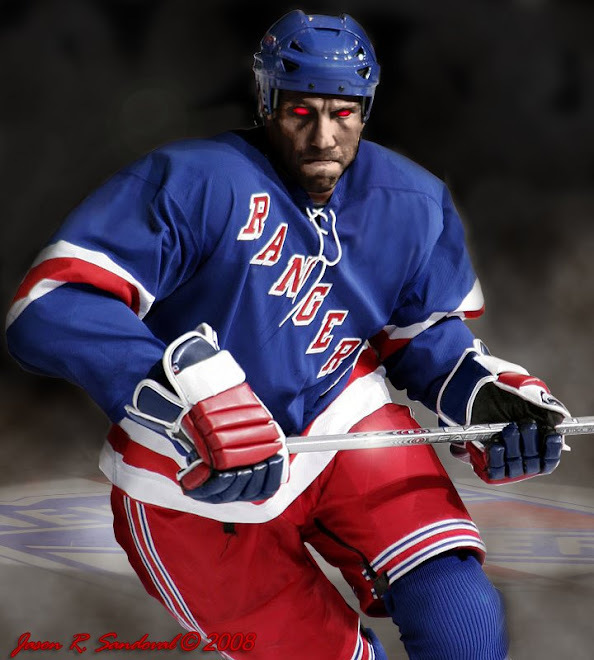 Tomorrow night the NY Rangers will see their final pre-season opponent - the arch nemesis' bionic Flyers. I expect them to start most of their opening lineup as to put on a good show for the fans. After living through the last dreadful season of last place in the NHL, Flyers GM Paul Holmgren has to do something for the fans pre-season. Oh right, there are the 'all you can eat' hockey seats......brilliance! The Dark Ranger expects nothing of tomorrow night, as we Ranger fans have come to realize that while every team we've played pre-season opened with their starters, while the NY Rangers are experimenting with a catalog of new prospects and first-class veterans. This does not appear to be the Rangers of old. Six more days. MSG: Rangers vs. Florida. 1) Kinda funny that we're more interested in a preseason game than the real one that takes place tomorrow morning! Hilarious Faux, and true I am more interested in tonight. Because I cannot watch the game tomorrow, I think watching Slapshot AGAIN is in order! Henrik looked great in goal last night...funny in the post interviews to see Avery busting on The King and welcoming him back to real hockey goaltending. This season is upon us and it's going to rock!